If you’re searching the net for Tuscany wine tours, and you’d prefer something private, this is the site to browse. My name’s Sergio, and I’ll introduce Tuscany and it’s wines as only a local can. However a day in Tuscany with me isn’t “just” about wine. We’ll also enjoy the iconic Tuscan scenery, and make numerous stops for photos. Pick up is from your doorstep (not from a meeting point), and you’ll travel in the comfort of a recent model minivan with AC. Please contact me for details. This is one of the few sites where you will book, and deal directly with the person doing your tour. 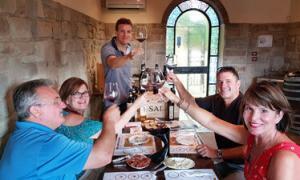 My premium Tuscany wine tours have been designed for wine lovers and anyone who cares to learn more about Tuscan wines. 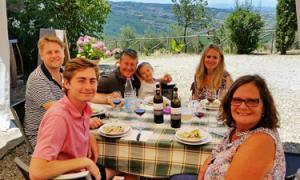 Enjoy personalized sit down tastings at family wineries of Chianti and Super Tuscan wines. We also have guided tours of the cellars. You’ll receive expert guidance in English, and many suggestions on how best Tuscan wines can be enjoyed. Scenic Wine Tours in Tuscany is the name of my site, so there will also be ample time dedicated to contemplating and photographing the spectacular landscapes. Lunch at a delightful restaurant or at a small winery is included. All my Tuscany wine tours are strictly private, and pick up is directly from your accommodation. 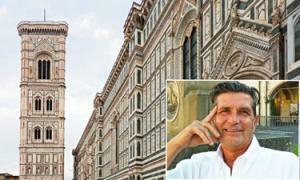 My premium “Wine Lover’s Special” has a specific version which sets out from Florence. A private wine tour to Tuscany departing directly from your doorstep in the city, not from a meeting point as many companies propose. This because I’m a licensed livery service with access to limited traffic areas. 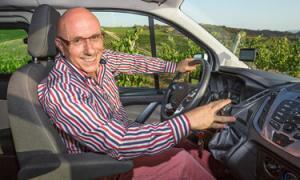 Travel will be in a recent model minivan all for yourselves, and your wine tastings will be seated and personalized. There will also be ample time for your holiday snapshots, and contemplating the iconic Tuscan landscapes. A perfect combination of fine wines and scenery, with full guidance in perfect English. I promise you’ll take home a better understanding of Tuscany, the land and it’s wines. Restaurants can be fine, but wouldn’t it be great to sample some home cooking? Well here’s your chance, as we take a Chianti wine tour to one of the region’s smallest family estates. The owner who isn’t a chef, “just” a great cook as you’d expect the perfect Italian lady to be, will prepare a typical three course Sunday lunch. Of course the estate produces excellent Chianti wines which you will enjoy with your meal. Last but not least, we’ll take time to enjoy the iconic Tuscan countryside making stops to admire the scenery and take photos. All my Tuscany wine tours are strictly private and departure is from your doorstep. If you don’t want to drag your feet around the crowded very hot city, here’s an easy way to visit the most famous sites of Florence. I’ve called this a walking tour but if you’d rather be driven in the comfort of an air conditioned minivan, it’s also possible. Just state your preference. A touch of culture as we learn about the world’s first city for art and architecture with your authorized guide, Maurizio Bellini. But we like wine too, so the afternoon will take us on a scenic wine tour of Tuscany, to enjoy a leisurely drive with photo stops. We’ll enjoy sit down tastings of Chianti & Super Tuscan wines. As with all my tours, this too is strictly private and departs directly from your accommodation. This is a great tour if you only have a casual interest in wine but would still like to enjoy the iconic Tuscan countryside. Of all my scenic wine tours in Tuscany, this is the one that puts a little more emphasis on the landscapes. However we’ll still be enjoying some great Chianti wine tastings. It also has a slightly lower price tag, and for four or more participants, the fee equals or betters those for group tours. Why do a group tour when you can have the comfort and flexibility of a vehicle and driver all for yourselves? Though less wine focused than my other tours, we still have two winery visits with tasting of Chianti and Super Tuscan wines. The tour departs directly from your accommodation in Florence: other locations on request. Have your day in Tuscany become a lifelong memory to look back on many times in the future. A Chianti wine tour and personalized photo shoot. Your own professional photographer as we travel through the Tuscan countryside. Couples, families and friends will have the perfect memory. The day also includes a home cooked lunch with paired wine tasting of Chianti, Chianti reserve and Super Tuscan wines at one of Tuscany’s top wineries. I’m a state licensed company with access to limited traffic areas, therefore my Tuscany wine tours depart directly from your accommodation. The day is obviously strictly private. We hear a lot about olive oil and it’s health benefits, but also about fake products. I promise that after today you’ll know enough to choose wisely. 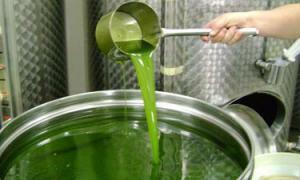 We visit an olive oil producer to enjoy a tasting and short lesson on how to recognize quality products. It’s not difficult when you know how. 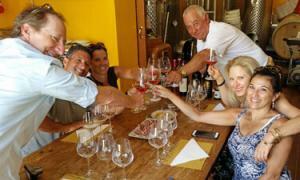 There will also ample time dedicated to enjoying the Tuscan scenery, plus a sit down tasting at one of the wineries from my premium Wine Lover’s Tour. I’m a state licensed company with access to limited traffic areas. This means that my Tuscany wine tours depart directly from your hotel or apartment. 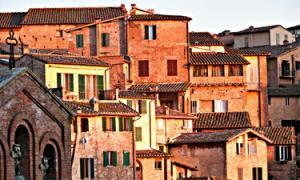 Tuscany wine tours can also be about city destinations such as Siena and San Gimignano. Of course we’ll also visit a small family winery run by a husband and wife team to taste Chianti and Vernaccia. In fact Vernaccia is one of the few white wine produced in Tuscany. The morning will see us in San Gimignano the town of towers, and everyone’s favorite, while the afternoon is dedicated to the red bricked town of Siena, second only to Florence in beauty. I’m a state licensed driver with access to limited traffic areas. You will travel privately and pick up is from your hotel or apartment (not from a meeting point).